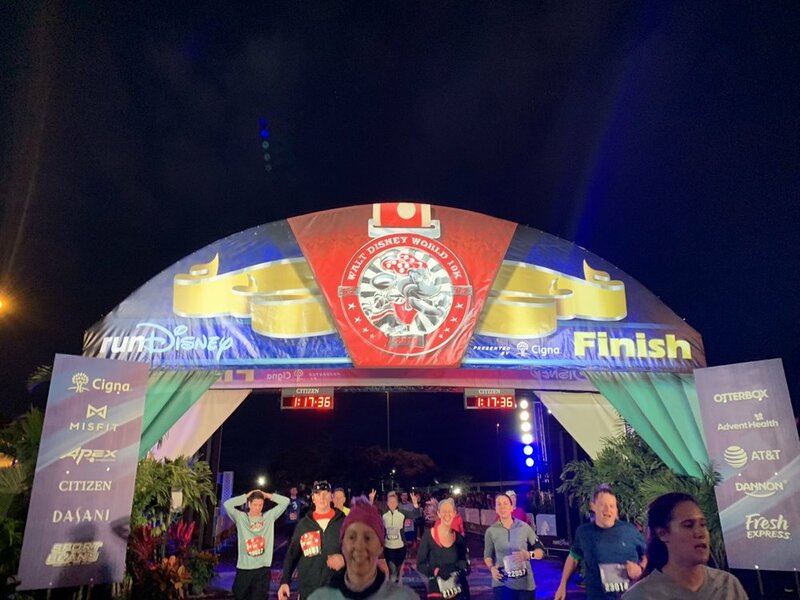 In this post, we recap the 2019 RunDisney Walt Disney World 10K race and provide some information on the 2020 race, scheduled to be held on Friday, January 10, 2020. We registered for the 2019 Walt Disney World 10K as part of the Dopey Challenge. The Dopey Challenge consists of all four Walt Disney World Marathon Weekend races—the 5K (Thursday), 10K (Friday), Half Marathon (Saturday), and Full Marathon (Sunday). To register for the Dopey Challenge, you just register for a single event (“Dopey Challenge”), you do not register for all four races separately. We’ll have a full Dopey Challenge post up in a week or so. The 2019 race was held on Friday, January 11, 2019. Registration is done online at the RunDisney website. RunDisney used to use a third-party provider for registration services, bus has since switched to its own (better) system. You’ll now register using your Disney account. Registration for the 10K is a straightforward process, so I’m not going to walk you through the specific process. Here are some relevant details. Registration for all the Marathon Weekend races was originally set to open in April 2018, but was delayed as RunDisney changed registration systems. Registration opened to the general public on July 19, 2018. As Walt Disney World Annual Passholders, we had access to early registration on July 17, 2018. The Walt Disney World 10K did sell out this year by July 20—the second day of public registration. Keep in mind the 5K and 10K attract a lot of local runners, which means a lot of early annual passholder registrations. The 2020 Walt Disney World 10K is scheduled for Friday, January 10, 2020. As always, it will be the second race of the four-race / four-day Walt Disney World Marathon Weekend. 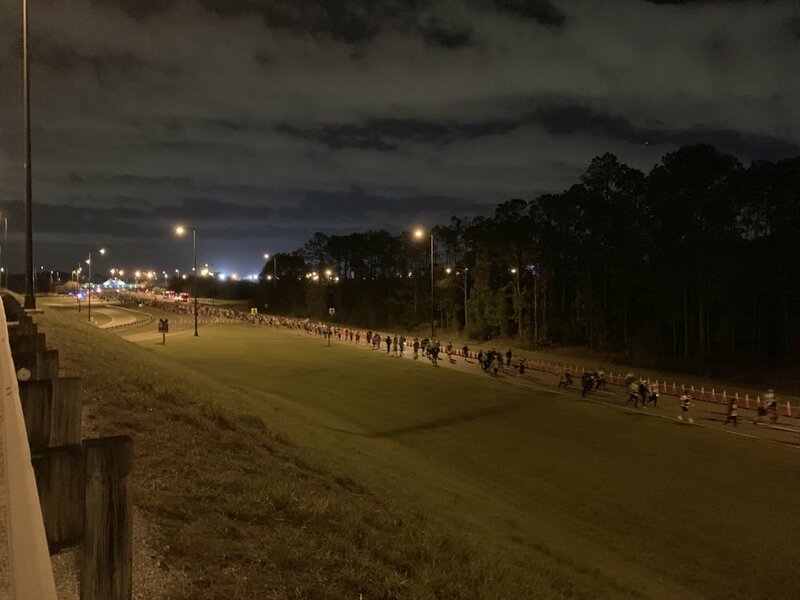 Registration for the 2020 races is set to move back to the old schedule, with Walt Disney World Marathon Weekend registration currently scheduled to open April 16th, 2019. Early registration is expected April 14, though I have not seen confirmation of this. If you’re interested in running the 2020 Walt Disney World 10K, you should join the official RunDisney email list and be sure to visit their website a few times between now and April to make sure nothing changes with registration. As the 5K and 10K usually sell out in the first day or two, we recommend you be prepared to register as soon as registration opens (usually between 10AM and Noon Eastern). If you don’t have a Disney account already, you should set one up today by visiting DisneyWorld.com. Even if the race sells out, you may still be able to run by raising money for charity. While we’ve done this for several other races, we haven’t done it for any RunDisney events. Here’s an example charity registration page for the 2019 races. For that organization, the 10K fundraising requirement was $500. You’re required to complete a signed waiver to run the race. RunDisney will provide you a link (usually by email) to get your form. You can either print this out at home and complete it in advance or print it at the expo and complete it there. Costumes are permitted and common at all the RunDisney races, though Marathon Weekend probably has the fewest due to its lack of a specific theme. Always check the RunDisney website for the latest costume policy. This is more a time for creativity than just going out and buying a costume. This is also one of the few times of year you might get away with wearing a full costume to the parks. This isn’t a “how to” guide to RunDisney costumes, but we want to remind you of some things. First, test your costume with a run (outside is better because of the wind, but a treadmill might suffice). We made the mistake of not testing our headgear for one outfit one year and basically had to scrap it because it the wind kept knocking it off. Second, never wear something brand new on race day. If you’re an experienced runner, you might know your personal exceptions to this rule. If you’re not, don’t underestimate the damage a simple poor outfit decision can create, particularly if you’re running Dopey (chafing on day one is…not fun on day four). Third, if you’re running Dopey, do your “complicated” costumes first. If it’s got bells and whistles, or if it requires an unorthodox piece of gear, wear it for the 5K or 10K. We’ll have more merchandise photos in our full Dopey Challenge recap. For now, we’re mostly focused on practical information for 10K runners and Dopey Challenge runners. If you’ve run a race before, you probably already know all this. The expo serves two purposes. First, it’s where you need to go to pick up three items: your bib (required for running), your complimentary race shirt, and your gear check bag (comes with your tshirt). Second, it’s a chance to buy more things. You can purchase official RunDisney merchandise, and there are a huge number of third-party exhibitors. Not everything is a sales pitch—there are speakers, demonstrations, and some fun things like free temporary tattoos. When we first started running, we loved race expos. Now we’re sort of over them. If you’re a new runner—or if you’ve never run a really large race—you should definitely plan for two hours at the expo just to soak in the excitement of race weekend. The expo is open to the public, and they sell spectator gear. Go ahead and bring any friends and family along. The Walt Disney World Marathon Weekend Expo is held at the ESPN Wide World of Sports Complex. Parking at the complex is free marathon weekend. If you’re coming from a Disney hotel, Disney will have chartered buses taking you between Disney hotels the expo. These buses run roughly every 30 minutes and stop near (but not always at) where the regular Disney buses stop at hotels. Each bus route has a color and/or number. When you return to your hotel, you’ll get on at the bus stop with your route number (it’s really easy and there are tons of volunteers to help you). The Expo is held on Wednesday through Saturday of race weekend. This year, the Wednesday hours were 10AM to 8PM. Dopey runners need to pick up their bibs at the expo on Wednesday for the Thursday 5K. 10K runners can pick up their bibs Wednesday or Thursday (10AM to 7PM). When you arrive at the expo, just follow the signs for bib pickup. If you already completed your race waiver, you can proceed straight to bib pickup. If you haven’t completed the waiver (like we didn’t), you’ll stop at a computer at the entrance, enter your last name and date of birth, print out the waiver, and sign it. The waiver has your bib number. Bib pickup will have different stands for different bib numbers. For Dopey Challenge, the pickup was one stop—we got our bib, tshirt, and bag all in one building. ﻿Dopey Challenge runners get two bibs—one for the 5K and 10K and one for the Half and Full Marathons. Dopey Challenge runners need to get a photo taken to confirm it’s actually them who completes all four races. Bib pickup for non-Challenge runners. 10K runners got their bib here and then proceeded to get their race shirt in the main expo building. Your shirt will be in your gear check bag. Check your shirt to confirm the size is correct, it fits well, and it is in good condition. Sorry for the poor quality. This is the area in the back of the Expo building where non-Challenge runners get their shirts. This year, there was a building dedicated to Official RunDisney Merchandise. We felt like RunDisney went a bit overboard with the amount of merchandise this year. There was a huge variety of shirts, pins, mugs, hats, ornaments, and anything else. Obviously if you’re a collector or just excited about your big race, then you might love this. It is good to see that Disney had seemingly everything in stock in large quantities when we were at the expo Wednesday night. In the past, eBay hawkers have created a real problem, but this didn’t seem to be the case this year. You can pay for official merchandise by any accepted Disney payment method (card, cash, MagicBand, gift card, Rewards card). Vendors at the expo sell all manner of things—running gear, race registrations, spectator gear, massagers, running fuel etc. As these aren’t Disney vendors, you’ll need cash or card. The race was scheduled for a 5:30AM start. Buses from the hotels began departing at 3:30AM (yes, you read that right), and Disney recommends you be on a bus by 4AM. I would love to see a comment from someone who pushed this later. Since non-runners and runners share the same buses to the staging area, I assume these buses run until about 5:30AM. Since it takes more than 30 minutes for all the runners to get through the start, I really suspect you could get on a bus at 5:30AM and still barely make the start. I’m definitely not endorsing this, I’m just putting it out there, and maybe someone with experience can comment. Anyways, I woke up at 3:45AM. I always get my race outfit ready the night before, particularly for these early RunDisney races. For every race, I pin my bib on my shirt (or wherever I’m pinning it) the night before so I don’t have to deal with that. If you’re running Dopey int he relaxed manner we run it, the 10K is really the first warmup race for the big two the next two days. You trot through the 5K, but you actually try and put some effort into the early miles of the 10K. I still didn’t dress for success though, which I sort of regretted, as my second day of sweatpants and layers (about 48 degrees when we woke up) got uncomfortable in the later miles. We left our room at Port Orleans—Riverside at about 3:58AM but missed the 4AM bus. We got on the bus at about 4:15AM and arrived at 4:38AM before making the 5-minute walk from the drop off to the staging area. If you’re checking gear (we never do), you’ll go drop that off (just follow the signs). Remember to use the big, clear plastic bag you got your tshirt(s) in. No other bag will be accepted. The biggest activity before (and after) the race is the opportunity to meet some characters. Usually, the lineup is Mickey, Minnie, the featured character of the race, and Dopey. Since Minnie is the featured 10K character, Goofy filled the fourth slot. These are four separate lines. Depending on how early you arrive, how fast you are, and how long you stay after, you can meet up to all four characters. We don’t have much advice on this, but we usually meet Dopey after the marathon. That might seem like the worst time, but the marathon has such high variance in finishing times—people trickle in over 3.5 hours—that it’s usually not a bad wait. Other than that, there are simple snack items for sale and a Joffrey truck. There’s also a merchandise booth (usually open only after the race), though you’ll definitely prefer to do your merchandise shopping at the expo. The race has two announcers / hosts who are on the main stage up until about 30 minutes before the race, when they move over to the starting line stage. Any normal person with a heart and a sense of humor will swing between laughter and having your heartstrings tugged by the heartwarming stories. And even if you're heartless and without a sense of humor...you will get wildly pumped up by their energy! About 30 minutes prior to start, the corrals open. Only runners with bibs are allowed into the corral area. We were corral A for the 5K and 10K. There’s no proof of time required for the 10K. Either I entered a targeted time or they used the time I submitted for the longer races. The 5K and 10K corrals are right next to the staging area. As I said, the announcers move over to the starting line stage when the corrals open, so you’ll get to enjoy them until you depart. The race starts in “mini-waves” released every two to three minutes. Every mini-wave gets fireworks. These waves are smaller than the corrals, so even if you’re in Corral A, you probably won’t start right at 5:30AM. Assuming the 10K has roughly the same starting times at the 5K, the latest starts were probably between 6:30AM and 6:45AM. The course map changes a bit every few years, but has a few consistent elements. It starts with three miles on the highway behind Epcot, then you enter Epcot through backstage, run around the World Showcase, exit and do a loop around the Boardwalk (our favorite park), re-enter the World Showcase, and finish by running past Spaceship Earth. Music plays throughout the World Showcase, which is also “IllumiNated.” Here’s the 2019 10K course map. Most of the people staffing the race are volunteers. Thank them every chance you get. We have a full post on RunDisney race etiquette here. We recommend it even for veteran runners. RunDisney in Florida uses the PhotoPass photography system. This means annual passholders and guests with Memory Maker will have complete access to their photos. Everyone else will either have to buy them individually or via Memory Maker (or some other package Disney offers). Not all character stops have Photopass—the occassional (to use a loaded term for this) “minor” character will not have a Photopass photographer. For those characters, you’ll have to have their Cast Member handler take your picture on your device. You’ll usually be able to spot on-course PhotoPass photographers ahead of time by their green tents, one on each side of the course. This might be covered in the etiquette post, but just try not to be a jerk about getting photos. If you want to jump or fly or whatever, go ahead, but don’t cut in front of someone just to get your perfect picture—it’s rude and dangerous. We saw nine character stops on the 2019 Walt Disney World 10K course: Ralph and Vanellope, Chip and Dale, The Evil Queen (old lady version), Move It Shake It Stilt Walkers (no Photopass), Geppetto (Italy Pavilion), Abu (Morocco Pavilion), Remy and Emile, Football Goofy, and Max. Lines are typically around 5 minutes, though anything from 0 to 10 occurs.The character stops are (almost all, see note on Photopass above) staffed by Photopass, and they’re happy to take a photo on your device as well (be prepared with it). Mind the fact that your lens might get sweaty and need a wipe to avoid lens flare (plenty of my pictures have it). Sorry for the lens flare—sweaty phone! There are photographers setup to take finisher photos. Gear pickup is right after the finish line. From there, you’re back at the staging area. This is a good time to grab some character photos (the four from before the race are back). We skipped that again. Unlike the 5K, buses were already running, so we walked right onto one at 6:55AM. We were back at the hotel at about 7:30AM. We much prefer the Walt Disney World 10K to the 5K. The 10K does have a more annoying start—a big out-and-back along the highway, but the rest of the race makes up for it. We’re big fans of the Boardwalk section of the race, and it’s the first close encounter you’ll have with spectators all marathon weekend. Like the 5K, there are more themed 10K races available in the RunDisney calendar, but you can’t always fit those into your plans (or maybe the themes don’t appeal to you). Especially if you’re planning a first 10K, the Walt Disney World 10K offers some great moments and is a worthy race!